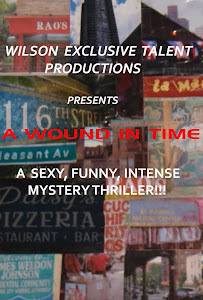 We'll be shooting the closing scene, as well as the remaining exteriors, when filming resumes of "A Wound in Time" in a few weeks. I'll be meeting with a well known Nuyorican poet, who is also a fixture in Spanish Harlem, to discuss his performance in the closing scene to be accompanied by the conga drumming of master congero Steven Guadalupe! They'll be dancin' in da street making for a very festive ending. Stay tune!